Raw, underproduced and real fast, Bonded By Blood is the slightly disadvantaged second cousin of Metallica's Kill'Em All. On their troubled debut, one of thrash's foundational albums, San Francisco's Exodus demonstrate plenty of vigour and willingness to break speed records with manic riffing. And while Kirk Hammett's first band (he left before this first record) would never reach the peak of the thrash metal mountain, it wasn't for the lack of trying. Some fundamental weaknesses hamper the record: everything is secondary to outright pace, and there simply isn't enough sophistication in the songwriting to overcome the underground origins. What remains is plenty of repetition, most tracks almost fully predictable within the first minute. Paul Baloff's vocals don't help much, his enthusiasm often stepping into theatrics. The guitar soloing is good, but rarely memorable. But the better tracks grab the steering the wheel and introduce curves to the linear energy. Title track and opener Bonded By Blood insists on a groove to channel the riffing towards dangerous territory. Deliver Us To Evil is easily the most ambitious selection on the album, and at just over seven minutes, also the longest by a good margin. 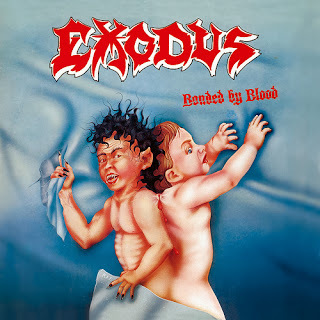 With just a bit of speed scrubbed off, Exodus can suddenly experiment with signature changes and a depth that is sorely lacking on most of the rest of the album. And Then There Were None is a seemingly weak track that suddenly, at the 2:10 mark, ditches the annoying vocals and sets out on an inspired instrumental journey for the next 2:30. There are no outright failed tracks on the album, a commendable achievement for a debut. Bonded By Blood may lack that touch of killer inspiration, but it nevertheless succeeds in chiseling one of the cornerstones for thrash's burgeoning mansion. Produced by Mark Whitaker. Engineered by John Volaitis. Mixed by Robin Yeager and Mark Whitaker. Mastered by George Horn.